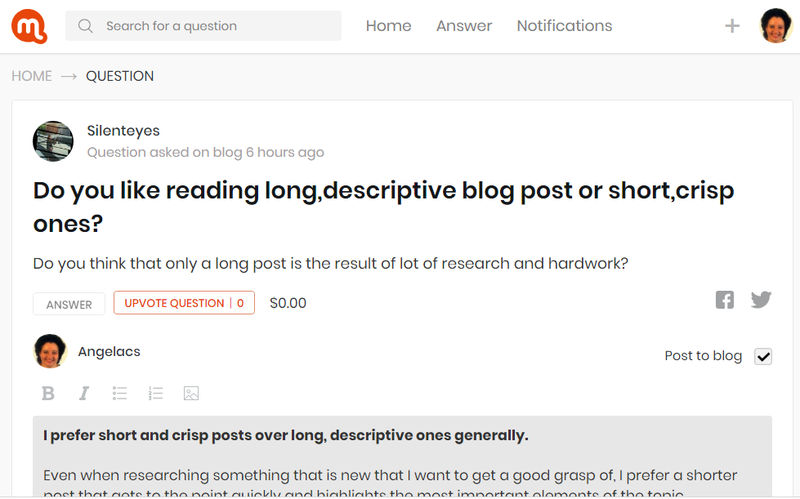 Do you like reading long,descriptive blog post or short,crisp ones? Do you think that only a long post is the result of lot of research and hardwork? I prefer short and crisp posts over long, descriptive ones generally. Even when researching something that is new that I want to get a good grasp of, I prefer a shorter post that gets to the point quickly and highlights the most important elements of the topic. That way I gain clarity and can then decide what elements to research further. I also appreciate an author who understands the fact that people are busy and takes the time to plan then share content in a concise way.. If the topic has many aspects to be covered, I'd prefer if the content is split in to several posts, starting off with an overview highlighting some of the aspects that will be covered in the upcoming series. There will always be content that covers topics comprehensively. And that is excellent when such coverage is needed and preferred. Even busy people will want to absorb details in a comprehensive way if it is a topic they need to immediately deep dive into. An example of this would be someone who has just received a medical diagnosis that is not fully understood. A comprehensive explanation of the condition, alternative treatments, medications, progress possibilities and long term risk and care management would be desired and needed. Happily, we live in a world where there is a wide selection of information in many different formats that content consumers can choose from. That is one of the miracles of the internet. It makes information available from all over the world that can be consumed, assessed and beneficially used as needed and desired. All that is needed is discernment of the quality of information being consumed in terms of factual sources, if relevant and possible biases, misinformation and agendas that the content creator and supplier of information may have. But that is another topic entirely. For my time constrained day to day consumption of information and even support of other authors, it is easier to use, benefit from and absorb content that is short and concise. If I come across even excellent information, I unfortunately have to bookmark it simply because I cannot stop long enough to go through it all. Oftentimes I never get back to it. I think it all depends what you are writing about. One needs to make it as entertaining as possible and at least make it a decent read. No one likes voting on something that looks as though no effort has been made. A few of my accounts that I have followed have made their posts a little bit shorter no was the stories were getting rather long.It doesn't bug me but when you are posting every day I suppose making it shorter to create an extra post is the smart way to go about things. I try and make my posts a 3 minute read and as interesting as possible. You are here to entertain your followers and that is what we have to do. Why else would anyone support you if you were posting rubbish everyday. If you use busy.org to post every day it tells you at the bottom how long the post is and how many minutes it is to read. I would stick to a 3 minute post and if you have to maybe a 4 minute post at tops. If you have loads to write about something split it up over a few posts and label it as such. It makes your followers aware that it is in more than one part and gives them something to look forward to. It depends on the topic in view. For a topic I have no knowledge of, I prefer a long post which tells me as much as possible about the subject. Long posts hand won't be boring if it is written well and in an engaging style. This could even to create the excitement for more. For instance, when the news came out about the hardfork 20, it was really new to me. I had no information prior to the release. So, what I did was to go around searching for blog posts on this subject and many of them were quite lengthy but it wasn't boring to me because the more I read the more knowledge I gained about the then pending updates. However, there are some long posts that are boring because the writer keeps repeating points. There it becomes clear that the writer was only concerned about the length of the article. A long post at times shows that the writer has done his research on the topic especially when references are given. Yes, and long post informs the reader in details about the subject matter. But there are times when shorter posts are better because people today have a short attention span and would want to get on to other things as quickly as possible. So, there goes the difference. Thanks for the question. I honestly prefer just a moderate amount of text on any blog post. Not too short and not too long, just a good amount of text. What I usually do after going into a post is skim it first, get a general idea as to what the post is all about and if it is indeed worth reading. If the post is an informative one and is written very clearly, then no matter how long it is I almost always read the whole post. I think it really depends on whether a post about something that needs understanding about a certain topic at a depth. If its a topic that I am not interested in, a short blog should be enough. I think at least there should not be too many redundant sentences. Later it feels really boring to read the same points. Also I guess it's the way a person writes it. If it's interesting, it would be interesting even if the length of that post is like the great wall of China. In conclusion, the best rule is to write it in a way which is clear yet is not repetitive. The post should answer every thing that is needed. It's just like filling up the water kettle to boil, we won't really fill it at the max line but at approximately that line. It relies upon the sort of article, by and large I incline toward short articles for news and slanting subjects. For this reason I utilize applications like Inshorts. For research reason and to enhance my Knowledge I lean toward Long shape articles. Medium is a decent place for this. Additionally elegantly composed blog entries are likewise great source. Well to be honest I will go through the post if it naturally means something to me. Like the posts that Steemitblog posts no matter how long they are we do get to learn things about the updates and all the things that are going in here. While there are posts interesting enough to go through even they are long but most of the time not so long post or not so short post does really attracts me and I will give my thoughts as comment and upvote as well with out a doubt if I get to like it. Well yeah it depends on the mood as well. Do men really prefer girls without makeup?Does intelligence determine a person's rate of success?Do you consider yourself incorruptible?How do we(you) define value on the steem blockchain?What could be the best way to do when STEEM is terribly low like now, STEEM is stabilizing at around 0.600$. At least give me 3 best thing to do in STEEM Blockchain that could benefit the user and the economy as well. ?How do you maximize SEO?What are the differences between client-side and server-side scripting?When do you start to celebrate Christmas?What should you never say to a musician?What is your favorite love / treason story?